Catholicos-Patriarch Karekin II (Nersessian) of Echmiadzin has completed his pastoral visits to the Armenian Orthodox Dioceses of Montevideo in Uruguay and Buenos Aires in Argentina. During his stays in both countries Catholicos Karekin celebrated the services, spoke with government officials, and met with representatives of the Armenian Diaspora in South America. More here (on the visit to Uruguay) and here (on the visit to Argentina). 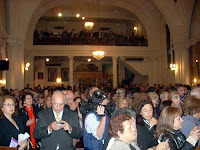 Pictured are the faithful of St. Gregory the Illuminator's Church in Buenos Aires during a service celebrated by Catholicos Karekin.